There are few things as annoying as a stunning pair of dress shoes suddenly developing an ongoing annoying squeak. Fortunately, you do not need to suffer from this common irritant as there are a range of solutions for squeaky dress shoes. 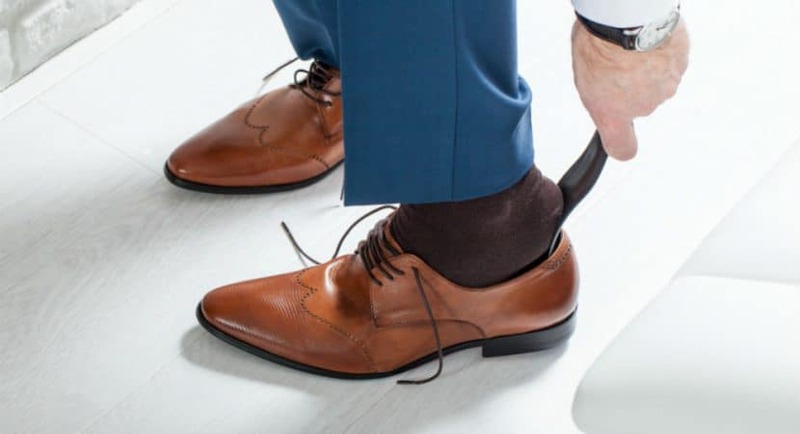 Here we’ll be taking a look at why dress shoes squeak, identifying each factor which could possibly cause them to make a sound and give you a way to stop the squeak. If the squeak is coming from a fairly new pair of dress shoes, then it is highly likely that they need to be broken in first. Put on your shoes and wear them around the house for a few days before wearing them out. Apply talcum powder and follow our other tips if necessary, but a few hours of breaking-in usually gets rid of any annoying squeaking sounds. Check the heel of your dress shoes to feel if they are slightly loose. If this is the case, simply apply a drop of contact cement onto each side where the shoe meets the heel, holding it in place for a minute to set. Weigh down your shoe for at least twenty-four hours to give the cement ample time to dry and your squeak will be gone for good. At times the moisture from your feet will become displaced to beneath the inner sole causing your dress shoes to squeak. Remove your inner sole and then sprinkle some talcum powder into your shoe, being sure to rub the talcum powder everywhere within the shoe including the sides of the inner sole. This will absorb any moisture present. Replace the inner sole and see if your squeak persists. Is Your Tongue Causing the Squeak? At times a squeaky dress shoe can be caused by the tongue of the shoe rubbing up against the rest of the shoe. To eliminate this as a possibility, rub the tongue of your dress shoe with saddle soap. If the tongue is causing the squeaking, this should fix things. Your laces are just as likely to be causing the squeak. If they are rubbing against the tongue, then rub both the tongue and your shoe laces with saddle soap and your problem is sorted. Depending on the composition of your dress shoes, conditioning oil should be readily available to stop any squeaks caused by lost oils. Dress shoes made from leather will gradually lose their natural oils which can cause the leather to dry out and squeak. Be sure to apply a tested, trusted commercial conditioner as homemade products can go horribly wrong and leather can often become damaged beyond repair if the wrong treatment is used. As soon as your leather shoes or leather soles begin to dry out in front of a heater or another artificial heat source they become brittle, losing the impression which they formed from your feet and beginning to crack. Along with this horrible tarnished appearance, an annoying squeak often develops. Just as we mentioned before, you can apply a commercial conditioning product to get rid of squeaks caused by dryness and a depletion of natural oils. Could Trapped Water Be Causing the Squeak? At times water can become trapped between the layers of leather of your sole or the joins and seams of your shoes. The will result in a terrible squeaking sound which you can only get rid of by giving your shoes ample time to dry. If you do resort to drying them in front of a heater, which may be necessary to get rid of the trapped moisture completely, then apply a conditioning product to protect the appearance and longevity of your dress shoes. Does Your Shoe Have a Leather Lining? If your shoe does not have a leather lining, then it is highly possible that your squeak could be caused by your foot slipping within your shoe. Add an ergonomic insert to help support your sole while also assisting the absorption of moisture. Be sure to apply talcum powder to the interior of your shoe as well. Are Your Dress Shoes Made from Patent Leather? If your dress shoes are made from patent leather instead of genuine leather, then it is possible that they will develop a squeak due to not correctly assuming the form of your feet. This happens most often with the heel. Spray the inside and the outside of your shoe with a light layer of water using a spritzer. Inside and out need to be damp but not wet. Then proceed to wear your shoes until they dry and you should be free from your squeak for good. If not, repeat the process until the sound goes away. Do Your Shoes Need Stretching? A very high-quality pair of leather dress shoes will have an extensive break-in period which is far too uncomfortable for most people to be happy with. In this case, be sure to use a shoe horn or stuff the insides of your shoes with crumpled up newspaper to full capacity, spraying the inside and the outside lightly with water first. A shoe tree is the best option for those who have multiple pairs of dress shoes which they want to stay comfy and squeak-free, although any means of stretching your shoe will effectively get rid of the sound eventually. A trapped air pocket, strangely broken loose heel, arch support or other problem could all cause an annoying squeak, without leaving you many options to fix it. In this case, a shoe repair shop will be able to assist you in getting rid of the noise. Most good cobblers will be able to eliminate any sounds emanating from a good pair of dress shoes, especially if they are made from leather. Most shoes with synthetic heels and soles cannot be easily repaired once they accrue damage, making leather soles and leather dress shoes the highly preferable option for anyone looking to make a lasting purchase.